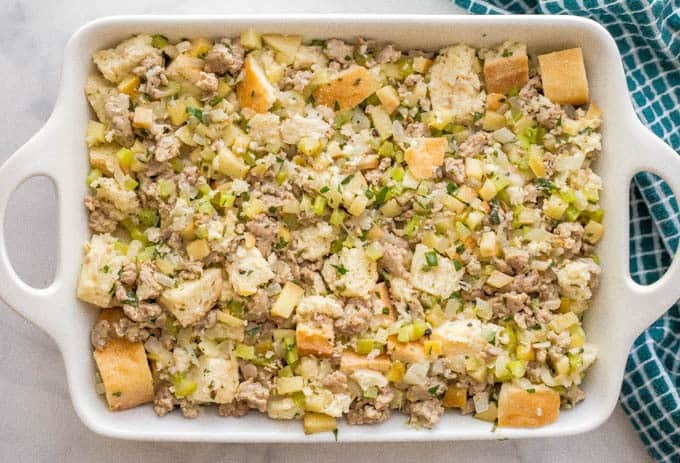 Turkey sausage and apple dressing is an easy, hearty and delicious side dish made with fresh ingredients — perfect for the holidays! Who’s excited for Halloween tomorrow?! I am back from a SUPER fun weekend in Nashville with some girl friends! We just had the best time hanging out, getting good food and drinks, listening to some live music and having girl time. I also celebrated my birthday with them and was happy to come back home and celebrate again with my family yesterday! We’ll get together with our neighbors tomorrow night in the cul-de-sac for pizza, snacks and drinks (and a fire pit!) before we start trick-or-treating. It’s such a fun tradition! I just need to figure out something quick + easy for a costume for me… but moving right along! Today’s recipe for this turkey sausage and apple dressing is a newer favorite! 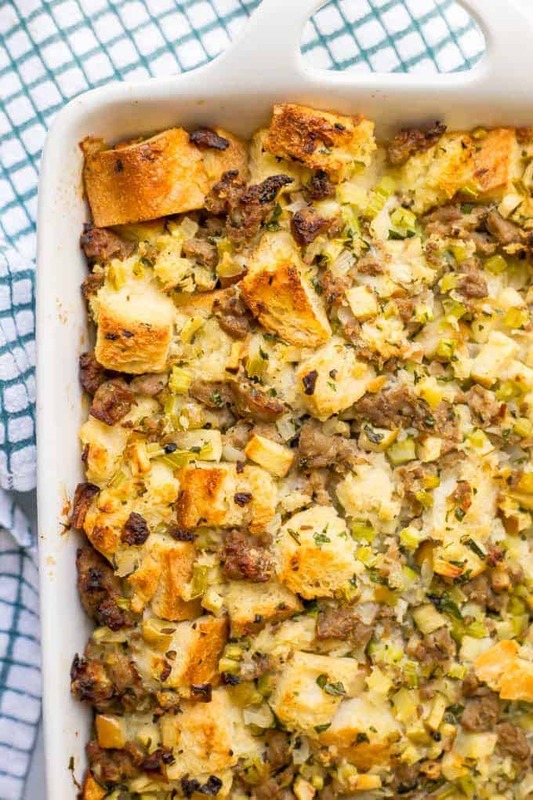 I made it for our family’s Thanksgiving last year and my mom said it was the best stuffing we’ve ever made. 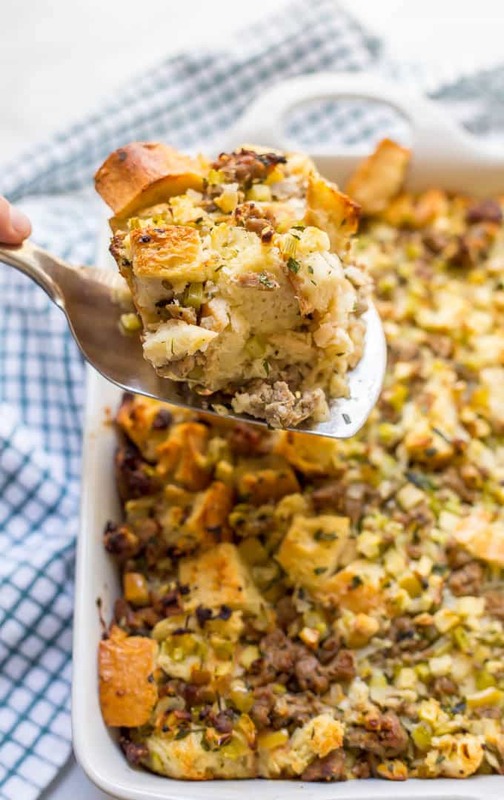 It’s got the traditional vegetables and herbs, cubed bakery bread, chopped apple, and cooked and crumbled turkey sausage spread throughout. 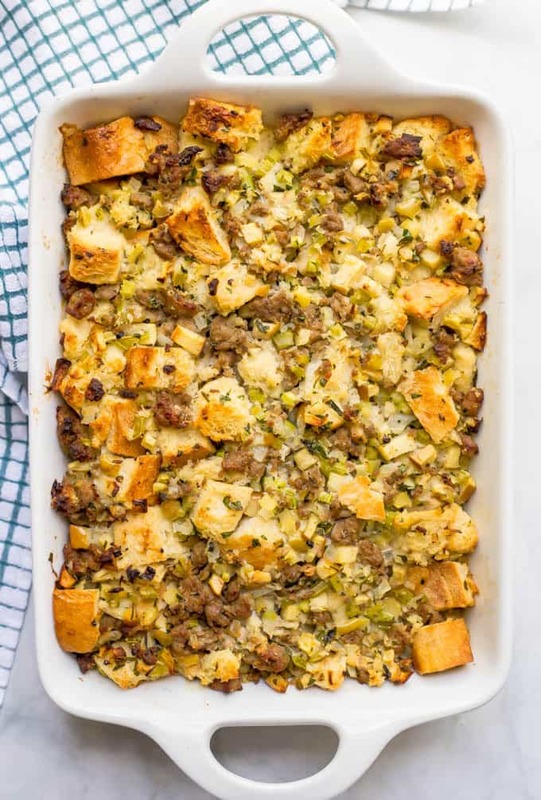 The bread pieces on the top of the casserole get toasted and crunchy, while the ones at the bottom are soft and tender. I love that contrast! 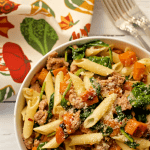 Speaking of contrast, I love using a hot Italian turkey sausage to contrast with the hint of sweetness from the apple and veggies, but you can certainly opt for mild. 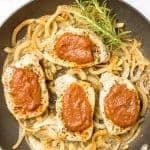 As mentioned, you can use mild or hot Italian turkey sausage or pork sausage. I use a Gala apple, but any sweet red apple will work. I use a 1 lb. loaf of French or Italian bread for this. Any good day-old bread would work here. If your bread is fresh, you can cut it into cubes, spread it all out on a baking sheet and bake in the oven at 275 for 15-20 minutes to help dry it out. If you need this to be dairy free, you can sub additional chicken or turkey broth for the milk. To prep this ahead, cook the sausage and sauté the veggies and store them in the refrigerator. (I also cut the bread and store it in a baggie on the counter.) Then proceed with the recipe when ready to bake. You will likely need to add additional liquid to the casserole once it’s prepped. This varies depending on the moisture level of your ingredients and also the bread you use. I just drizzle extra broth over the casserole dish until it seems wet enough (you don’t want it to dry out too much while it bakes). We bake and serve this in a casserole dish on the side, but feel free to use it as a stuffing in your turkey if you prefer. 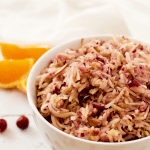 I hope you give this turkey sausage and apple dressing a try — maybe it’ll be your family’s new favorite too! 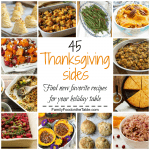 And if you’re looking for other Thanksgiving or holiday side dishes, check out my bourbon sweet potato casserole, roasted Brussels sprouts with bacon and 15-minute easy cranberry sauce. Hoping your holiday table is filled with love, laughter and yummy eats! And hope you have a spooky, fun and safe Halloween! 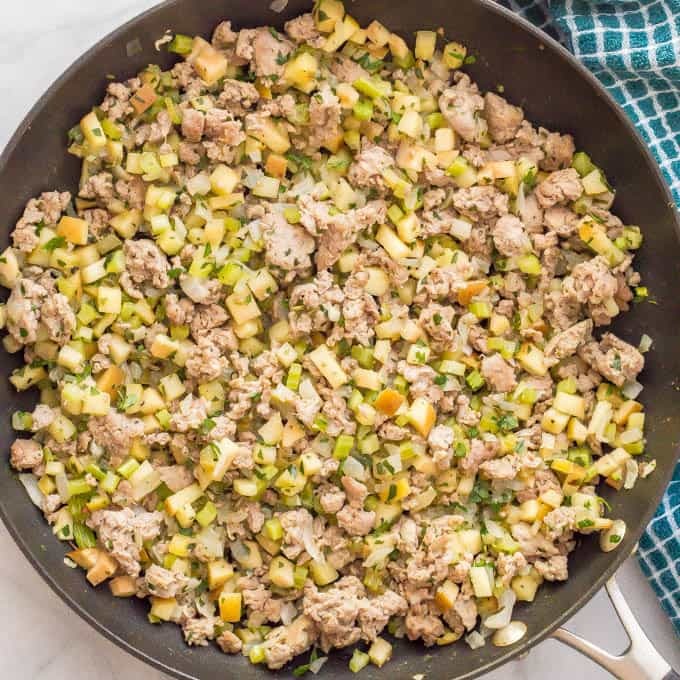 Turkey sausage and apple dressing is an easy, hearty and delicious side dish that's perfect for the holidays! Preheat oven to 350. Spray a 9x13 casserole dish with cooking spray and set aside. Heat a large sauté pan over medium heat. Add the turkey sausage and cook, breaking it up with a spatula as you go, until cooked through and in small crumbles. 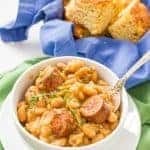 Remove the cooked turkey sausage to a bowl. Melt the butter in the sauté pan. Add apple, onion, celery, parsley, rosemary, salt and pepper. 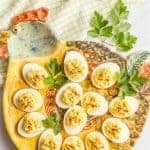 Cook, stirring occasionally, until vegetables and apple are tender. I, a large bowl, combine cooked sausage, apple and veggie mixture, cubed bread and stir to combine. Add 2 cups of broth, milk and eggs. Stir until everything is well coated. Bake at 350 for 45-50 minutes, until set. Let sit for 5-10 minutes before serving. You will likely need to add additional liquid to the casserole once it's prepped. This varies depending on the moisture level of your ingredients and also the bread you use. I just drizzle extra broth over the casserole dish until it seems wet enough (you don't want it to dry out too much while it bakes). Sometime it's 1/2 cup, sometimes up to a full cup. 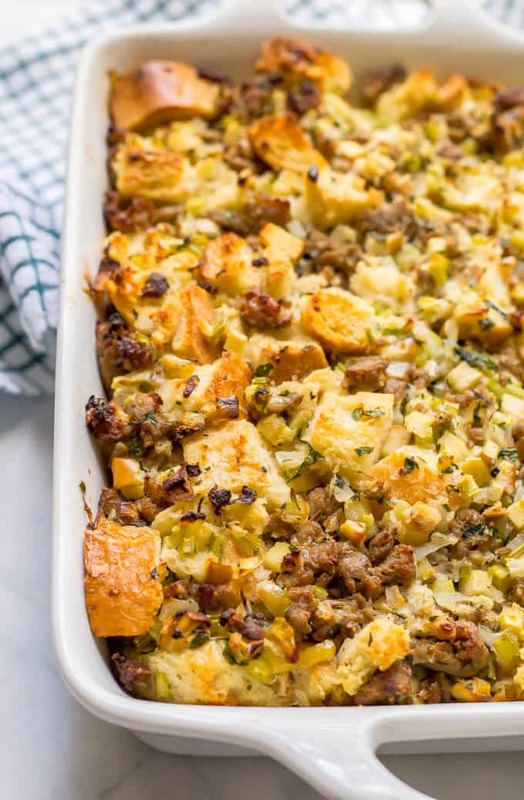 Stuffing is my favorite food at Thanksgiving, but I’ve never had it with turkey sausage and apples! I don’t think I can wait a whole month to try it – for sure making this next week. Looks so good! Thanks! We had a fun Halloween for sure!